On Tuesday, I got up early and went to bootcamp class. Then I saw a nutritionist. Then I ate a cupcake. I think these were all good life decisions. My workout schedule has me running or at the gym an hour a day, six days a week. That's a lot of calories burned. I am always hungry. I am always eating. So, I wanted to check in with a nutritionist and see if I'm fueling up with the best food possible and getting the right nutrients. And I wanted to know if I'm eating enough protein (turns out that I'm not). In general, I already eat well. I have very few vices. Most of our conversation centered on incorporating more complex carbohydrates (quinoa! millet! buckwheat!) and more leafy greens (spinach! kale! arugula!) into my diet. Then my nutritionist looked straight at me and asked me if I could give up sugar for two weeks. I promised her that I could. I totally could. I just neglected to tell her about my cupcake date later that afternoon. It's a secret between you and me. Please don't blow my cover. But I'll be honest. I didn't feel guilty at all about the cupcake. I have no guilt when it comes to eating cupcakes, buying shoes, loving 90's boy bands and pop music, and generally misbehaving. We met up at the newly opened Georgetown Cupcake on Newbury Street. It's a pretty shop, with tall ceilings, marble counter tops, and colorful Andy Warhol-style posters. 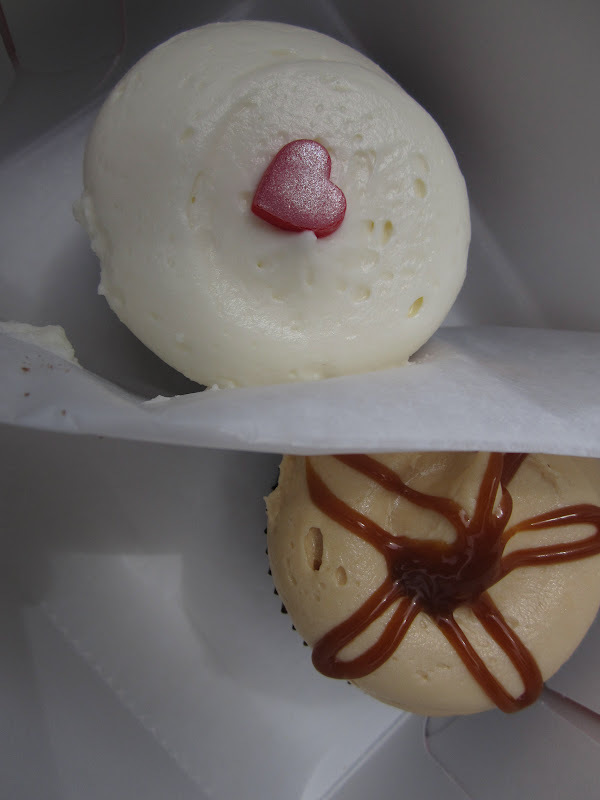 We stared for a while at the cupcake display and finally decided to split the Red Velvet Cupcake and the Salted Caramel Cupcake. The shop has a serious lack of seating and the two (only two!) tables were taken. 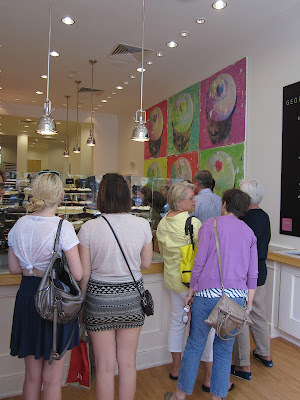 We took our super-cute pink box of cupcakes to go, found a spot to sit in Copley Square, and got down to cupcake-eating. I'm always way more into the frosting than the cake and this was no exception. The Salted Caramel frosting tasted sweet and buttery, but the salt cut the sweetness nicely. The cream cheese frosting on the Red Velvet Cupcake was the classic, tangy-sweet frosting that you'd expect. The cake itself was moist and not too sweet. Definitely not nutritionist-approved. There was no spinach... no kale... no quinoa. But I think our cupcake date was an excellent decision. I think a good plan for next time is to get cupcakes, take them home, and eat them while simultaneously dancing to 90's boy band music and buying shoes online!! dancing burns calories!!!!! I'm so up for the salted caramel cupcake. A girl has to have some vices! I want to go back soon and try one of the seasonal flavors!